DOES ANYONE REALLY KNOW HOW THE FIRE GOT STARTED? No, but Cyndy was the only one home at the time…..that’s the main thing. For the longest time it was completely inconceivable to me that my house could have caught on fire while I was home alone without it being my fault. I have recently read that people who blame themselves for everything actually have an overdeveloped sense of self-importance. They believe that they can always make things better and that is their number one goal and they always feel very guilty and disappointed when their efforts do not have the desired result. Supposedly the ego is what drives this type of behavior with all of its good intentions. I really wasn’t thinking about all of this during the time that I was feeling so helpless and yet so responsible. My poor little ego was simply struggling to survive and all I had to hold on to was the feeling that it was my actions that had somehow caused this thing to occur and I was guilty, guilty, GUILTY. Here is a big example of my thought processes at the time: When we saw our bed’s headboard lying in the yard with a big charred hole right in the middle, directly under where the lamp had been and with virtually no damage on the end where the candle had been, I said, Why is there a hole there in the middle? That’s not where the candle was. That’s really weird. The candle must have boiled over or something and then the headboard must not have been level so the wax flowed slightly downhill along the surface to the exact spot where the cord of the lamp was and then the hot wax probably melted the cord and that was what made the lamp explode. That must be how it happened. And I was the one who lit that candle in the first place. So I did it. It’s my fault. Does this sound like a scientific chain of events, or does it sound ridiculous? Doesn’t wax solidify when it hits a colder surface? At the time, and for way too long afterwards, I believed this theory with all of my heart. I could not be swayed by reason or by Doug saying it was more likely that the lamp malfunctioned. My brain had clearly not recovered from the previous night’s events when I first saw the headboard. We had so many things to do and think about that I just left it at that and moved on to what we had to do next. And here I am still thinking about it 2 ½ years later. It is time for my personal guilt trip to finally end. WE ignored the lamp, and we paid the price. Here is a picture of the headboard leaning up against the side of the house. Please Observe: The lamp was in the middle where the big hole is. The candle was on the side where there is no damage. AND I AM NOW OFFICIALLY DONE WITH THIS TOPIC. This past weekend we were driving home from New Hampshire and we stopped in for a visit with Jennifer, my roommate from college, and her family. About a year ago she also had a house fire. 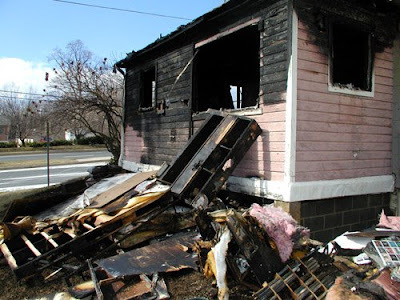 Her garage spontaneously and rather explosively burst into flames while she was out of town. They had to move out of their house for about 6 months while the insurance company’s contractor rebuilt the inside and replaced all of the roofing and siding on the outside. That is basically what the insurance company was going to do for us before Doug, I mean we, got all creative with the alternatives. Jennifer's house is now a new and shiny replica of its formerly beautiful old self. It looks great. I feel discouraged that ours is taking so long, but I am also inspired to see how beautifully hers turned out. Ours will be equally beautiful one of these years. Jennifer was, and continues to be, one of my main inspirations for playing the bass. I used to be her accompanist in college and I saw how much fun she had playing her bass in so many different groups and styles. We went to hear her play in a big band concert while we were there visiting, and all of the memories of watching her play way back then came flooding back to me. I am so glad that we became friends and are still in touch after all of these years. We were driving around some neighborhoods in our area looking at door trim and exterior lights on various houses when we passed a wooded area that was slightly on fire. It was burning relatively gently – not anything like our fire. We looked up and saw that the power lines between two telephone poles were in flames. That was kind of scary looking. We called the fire department and then we called PEPCO. We hung around until they came so that we could give them an update if it started going crazy. It didn’t really spread very much. I thought it was weird that we, of all people, would be the ones to happen upon an exterior electrical fire. It felt good to be able to do something about it before it caused any real damage. I wonder whether it affected the electricity for the people who lived nearby while the lines were burning. I guess the electric company probably had to turn off the power to do the repairs. SHE ALMOST HAS HER SENSE OF HUMOR BACK!!! A few days ago I played a session with Tom, the drummer from the show I used to do. It was nice to see and play with him in a small group setting for a change. We were talking about the house and a mildly humorous candle reference occurred. Although I know now that Doug always felt that the lamp had caused the fire, that fact seemed to always be overshadowed in other people’s minds by the fact that there also happened to be a burning candle present at the time. This impression is probably entirely my fault because I never ever failed to mention it when anyone asked. Candles can be a fire hazard - that is a fact. So Tom seemed kind of surprised when I explained the whole lamp theory to him. I really didn’t know the extent to which various people have had an opinion about the exact cause of our fire. I’m not saying that Tom is one of those people, but it is possible that some people think that I used a candle to burn Doug’s house down because I was there when it happened and he wasn’t. I know there are people who might prefer to look at it that way because I’ve overheard them actually saying things to that effect. Of course they were joking, or at least I hope they were because it’s really quite hilarious, don’t you think? I suppose that I will also be able to laugh at the whole thing once I am back in my house and have been able to resume my previously wonderful life of gigging and traveling. But in the meantime I am forced to stay home to do grueling 14 hour days of carpentry, sanding, painting, vacuuming up all of the sawdust, being hot and sweaty and dirty and gross, and having to buy millions of house-related things that I really wish I didn’t have to pick out. It is not fun at all, but I am stuck doing it and there is no reasonable alternative. I really am looking forward to the day when I can look back at all of this and laugh about how crazy and absurd it all has been. I’ll just have to be patient a little while longer…..I’ve had to wait for a lot of things longer than most people could ever imagine, so I can wait for this too. Better times are definitely coming. Eventually.